One of the most exciting new UK female artists, Jerry Williams, has just revealed the official video for her brand new single ‘Boy Oh Boy’, out November 13th, which can be seen below. True to her throwback retro look, the video sees Jerry travelling between different live scenarios in a vintage MK2 1967 Ford Cortina, cut with captivating one-shot performances to the camera, further showing Jerry as a potential UK pop star. The 19-year-old ‘girl next door’ from Portsmouth, who’s fresh off the pages of the new special 10-year anniversary issue of Wonderland Magazine, has taken this track from her latest EP ‘Cold Beer’, out now. 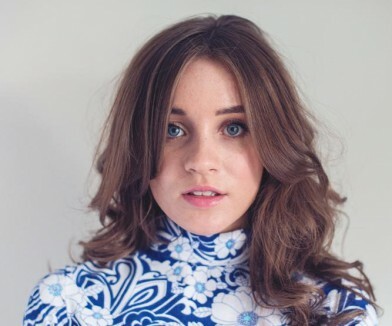 ‘Boy Oh Boy’ has already been tipped by The Guardian and Music Week, and the teenage songstress is being compared to the likes of Lily Allen and Gabrielle Aplin. The track shows off Jerry’s intricate and rhythmic acoustic guitar playing, while lyrically exploring romantic mind games and keeping her distinct retro sound. There’s a freshness to the 19-year-old’s narrative storytelling that is striking a note with everyone who comes into contact with her music. This has already drawn the attention of some big songwriters and Jerry has now penned tracks with Newton Faulkner, Carey Willets (Athlete), Jim Duguid (Paulo Nutini, Alex Clare) and Dan Carey (Miles Kane, Nick Mulvey, Sia). Live, she already has a string of high profile support slots under her belt, hitting the stage with the likes of Rixton, Maverick Sabre, The Hoosiers, a sold out UK tour with Nathan Sykes (ex-The Wanted) and appearances at this year’s Great Escape and Wilderness Festivals. A self-confessed songwriting addict, Jerry admits “I would happily write songs all day, everyday, forever.” Drawing inspiration from artists such as Vampire Weekend, Slow Club and Coldplay, her life growing up in Portsmouth and her relationships with boys, she’s already made a huge impact on her local scene, winning The Portsmouth Guide Award for Best Solo Performer Of 2015, and packing out venues across town, including a recent sold-out 300 capacity EP launch show at Tiger Tiger.